A decision by the OMB is expected by December 31, or the City risks another term of outdated boundaries. A decision is expected by New Year’s Eve on whether a few more seats will be added to Council chambers. Photo by Christopher Hylarides from the Torontoist Flickr Pool. The clock is ticking on a decision by the Ontario Municipal Board that will determine whether Toronto will have new ward boundaries, including three entirely new wards, in time for the next election in 2018. “The board will endeavour to complete the written decision and order by December 31, 2017 in order to accommodate the 2018 election cycle,” according to Ben Toye, a spokesperson for the Ontario Municipal Board, who added that this was not a “confirmed deadline” for the decision’s release. 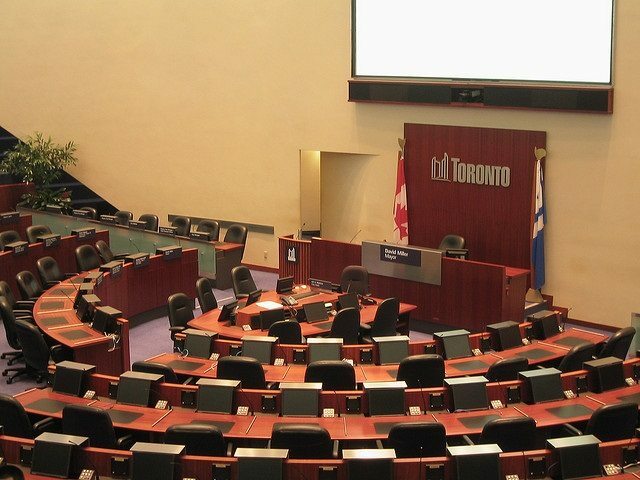 The City of Toronto Act requires a final decision on any changes to wards by December 31 of the year before a municipal election so that “the number of wards and their boundaries will be clear to voters and candidates during the election year,” said Wynna Brown, a spokesperson with the City Manager’s office. The OMB scheduled an appeal for both citizen and councillor appellants, the last chance to hear and resolve such an appeal before time runs out. The hearing began on October 10 and concluded last week on October 20. The election is scheduled just under a year from now on October 22, 2018. If there is no final decision by December 31, the City is required to continue to use the existing 44 wards for the 2018 election and 2018-2022 Council term, and any new ward structure would not apply until the 2022 election and the 2022-2026 Council term. The City of Toronto has already engaged in a lengthy process to add three additional ward seats as well as redraw a number of ward boundaries to better reflect the changing demographic realities in the city. That process began in 2013, when independent consultants were tasked with reviewing Toronto’s ward boundaries on behalf of City Council. Council opted to select a 47-ward option, which would add to the 44 wards currently in the city. Earlier this year, however, Councillor Justin Di Ciano (Ward 5, Etobicoke Lakeshore) and Councillor Giorgio Mammoliti (Ward 7, York West) appealed the ward boundary change bylaw, actions which risk delaying the implementation of the new boundaries. Mammoliti did not return a request for comment, but Di Ciano says he felt his appeal received a fair hearing by the panel. Professor Alexandra Flynn, an assistant professor at the University of Toronto Scarborough who specializes in urban governance, says that ward review processes are especially complex for municipalities compared to the provinces and the federal government. “It’s complicated for municipalities, because they don’t have an itemized list that tells them exactly how to conduct ward boundary reviews,” said Flynn. “There is no requirement that one OMB panel follows the decision of another OMB panel, which is different than in a court. Because Toronto is such a large city, with certain regions continuing to grow in population size at an incredible rate, and there are so many stakeholders (and councillors) involved, ward boundary reviews are even more difficult here compared to other municipalities. “The boundaries are already so widely disproportionate, in terms of population size, just from the simple fact of representation, it’s just not fair to have voters going to the ballots knowing that their votes are going to mean less in certain parts of the city,” said Flynn. There is no legal requirement that the City conduct an internal review every 10 years, unlike many other jurisdictions in North America, and it’s therefore “always going to be a very difficult, very political decision for the City to decide that they are going to have a review process on a regular basis,” said Flynn. Flynn says the City’s review process was conducted appropriately. “The process was pretty airtight, in terms of having consultants who oversaw the process, lots of opportunities for the public to engage, councillor input at multiple stages, executive committee approval, including another investigation of whether the federal ward boundaries made sense for Toronto. “I do think that [Di Ciano] is entitled to his opinion that the federal boundaries should be applied, but people who know a lot about this issue gave some very good arguments as to why that did not make sense in the Toronto context, and City Council approved that interpretation by a fairly large margin. Flynn argues that imposing regular ward boundary review processes for municipalities is a responsibility that should belong to the province.